Last Saturday, Democrats in the 5th Senate district participated in a firehouse primary to select the party’s nominee. Chesapeake Del. Lionell Spruill, Sr. was the winner, besting Norfolk Del. Joe Lindsey by a wide margin – 68% to 32%. As noted previously, this contest just determined the party’s nominee, as the filing deadline for a challenger for the November special election had yet to pass. The deadline was yesterday, July 15. It is a little unusual to have a filing deadline fall on a Friday, particularly given that each party would be holding a caucus to nominate. The best time to hold a caucus is on a weekend, when more people are able to participate. The filing deadline, then, would usually be the next business day (or the day after that), so Monday or Tuesday. (Had there been time for a full-scale primary, the filing deadline would have been 7pm on the day of the primary.) This 7/15 deadline was five business days later, which could have given a challenger sufficient time to gather signatures to get on the November ballot. I don’t know what 5th Senate District Republicans had planned as I cannot locate anything. Wisely, though, they chose not to field a candidate in this heavily Democratic – more than 70% – district. 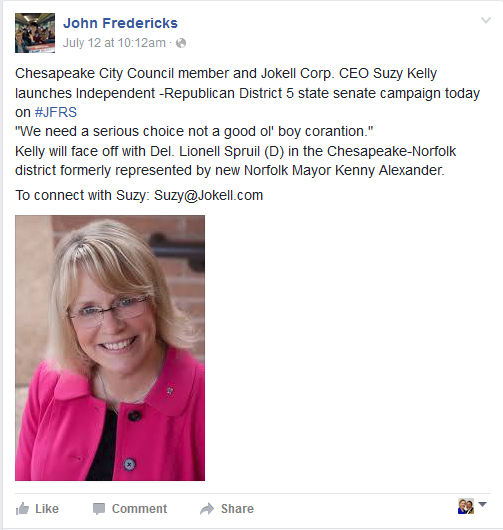 So I was a little surprised to learn earlier this week that Chesapeake City Council member Suzy Kelly was planning to run as an independent. I know Suzy Kelly – although not very well – and she is a pretty smart lady. I just couldn’t imagine why she would make this move. (Note: the quote “We need a serious choice not a good ol’ boy corantion [sic]” is from John Fredericks, not Kelly, as noted by him in the comments.) It just made no sense. The district’s demographics were against her, the special election is in November in a presidential year, and I can only imagine more than a few Chesapeake Republicans would be upset with her, which would be damaging for the future. As it turns out, Kelly did not file. Although the election will be held November 8, only Spruill’s name will be on the ballot. There is, of course, always the possibility of a write-in so technically, I can’t call him Senator-elect Spruill. 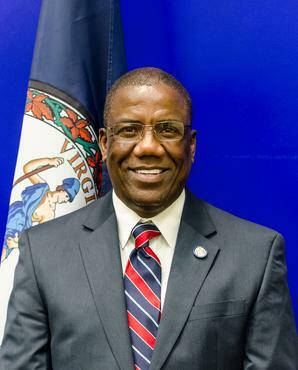 But I think it’s safe to say he will be joining the Virginia Senate.